Gold and Blues Brothers | "Those who know Notre Dame, no explanation is necessary. Those who don't, no explanation will suffice." SOUTH BEND, Ind. – So far, Notre Dame’s season has been defined by gritty wins and come-from-behind nail biters. Clearly, head coach Brian Kelly inspires his team to respond when deep in a hole, because – for the third straight week – the Fighting Irish have come from behind in the second half to win a game. 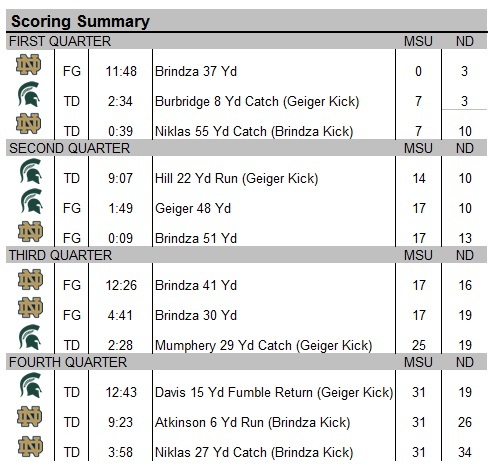 The Michigan State Spartans entered South Bend boasting a 3-0 record. 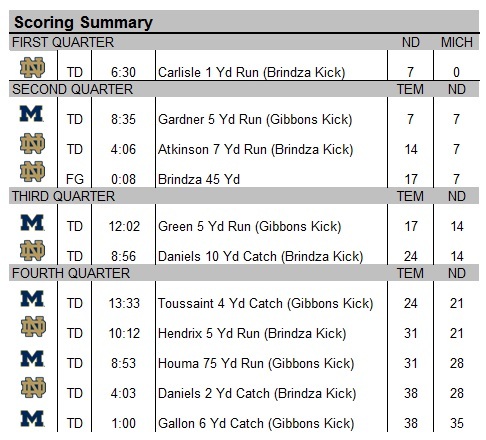 Late in the 4th quarter, they believed they’d be leaving Notre Dame Stadium still undefeated. But, Kelly and his army had different plans. After linebacker, Ed Davis, scooped up a Tommy Rees fumble and returned it for a touchdown, it seemed like the game was out of reach for the Irish. The final nail had seemingly been pounded into the coffin as the score stood at 31-19 with only 12 minutes left in the game. Rees showed frustration on the sideline by slamming his helmet to the ground – an act that seemed unfamiliar to those surrounding him. But, that display of frustration was exactly what the offense needed to see. They rallied behind their discouraged quarterback, lifted him up, and fought. On the ensuing drive, Rees’ demeanor morphed into a persona that may dictate the remainder of the season’s success. He showed a passion and a yearning that provided the perfect amount of spark the Irish needed. George Atkinson capped an 80-yard drive with his first touchdown of the game pushing the Irish within five. The grit wouldn’t end there, though. Michigan State marched back down the field and into the redzone. What seemed like yet another breaking moment for the Irish defense turned into another miraculous come-from-behind rally. Bennett Jackson – for the second game in a row – recorded a timely interception. 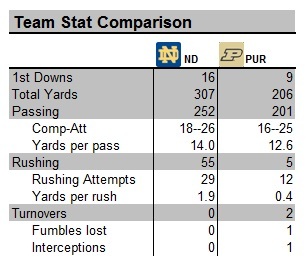 After returning it 42 yards, the Irish were within striking distance. Time was winding down, and a field goal wouldn’t do the trick. On cue, Rees connected with one of his favorite targets, tight end Troy Niklas, for his second touchdown of the night, pushing the score to 32-31 in Notre Dame’s favor. After a successful 2-point conversion, the Spartans needed a field goal to regain some momentum. But the Irish defense held, leaving the Spartan fanbase stunned. The 4-0 Irish face another tough homestand matchup next week, as 4-0 Oklahoma comes into town. The Sooners will be playing with an extra chip on their shoulder, as the Irish went into Norman last year and embarrassed them 30-13. *All stats, quotes, and ideas are purely fictional. This is a simulated recap, is for entertainment purposes only, and does not reflect any actual outcome. WEST LAFAYETTE, Ind. — From a defensive standpoint, last week’s bout with Michigan was a night to forget. Aside from last year’s National Championship appearance, Notre Dame’s defense hadn’t allowed that many points to an opponent since the 2011 season. Things would be much different tonight, though, as the Fighting Irish (3-0) defeated the Boilermakers (1-2) in West Lafayette 34-13. This comes as a relief to the Irish faithful, as many questions loomed around an under-performing, dominant defense. A season removed from being one of the nation’s best, and after returning eight of its starters, Notre Dame’s once-stingy defense finally found its groove late in the 2nd quarter. Team captain, Bennett Jackson, picked off Purdue quarterback Rob Henry, and took the interception all the way to the house, giving Notre Dame its first touchdown of the game. That would be all for the half, though, as both defenses held each other to field goals setting up a 10-6 halftime score. Other than a costly miscue that led to a 47-yard touchdown pass early in the 3rd quarter, the Irish held Purdue scoreless in the second half. Henry, who is coming off of knee surgery, had a difficult time escaping the rushes of Louis Nix, Stephon Tuitt, Jaylon Smith, and Sheldon Day. The four combined for 4 total sacks, making the game nearly unmanageable for Henry. He did finish with 201 passing yards, but the constant pressure created too many missteps for them to ever recover. Following a Farley fumble recovery deep in Boilermaker territory, starting quarterback Tommy Rees connected with sophomore receiver, Chris Brown, to retake the lead in the 3rd quarter. The game would get no closer, as Rees connected with true freshman Corey Robinson (son of NBA Hall of Famer, David Robinson), on the ensuing drive. With the game out of reach for the Boilermakers in the 4th quarter, Cam McDaniel’s only touch generated seven more points for the Irish. 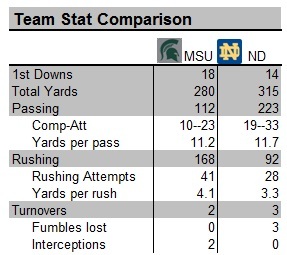 After two straight away games, Notre Dame is back home against Michigan State next Saturday. The Spartans come into South Bend boasting a 3-0 record. ANN ARBOR, Mich. – Though the home crowd would disagree, there couldn’t have been a more fitting ending for the Irish’s last scheduled game in Ann Arbor. Despite a game-ending injury to starting quarterback Tommy Rees, the Fighting Irish (2-0) prevailed with a 38-35 victory in what will go down as yet another instant classic between the two storied rivals. After scoring with 1 minute left in the game, the Wolverines (1-1) were unable to convert an onside kick, ultimately sealing their fate. As the clock wound down, many Irish fans were reluctant to call it a victory until it was officially over. They knew better, as the last four contests have been decided by a total of 19 points. 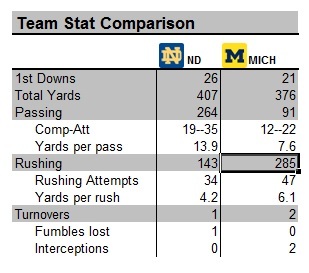 This game would be no different, as the Irish held on to win in back-to-back seasons by less than a touchdown. Amir Carlisle started the game right where he left off with Temple, scoring the first touchdown of the game, giving him his fourth of the season. It wasn’t long after that when starting quarterback Tommy Rees was seen limping off the field in what seems to be an apparent leg injury. “Tommy is our guy. We’ll give him some rest this week as we prepare for Purdue, but we fully expect him to be ready for game time,” head coach Brian Kelly announced after the game. This comes as a relief to Irish fans, as the football program has been riddled with injuries to several key players. However, it seemed as if backup quarterback Andrew Hendrix was determined to live by Kelly’s “Next Man In” mantra. The senior filled in nicely for the injured Rees, throwing for 207 yards and 2 touchdowns, while also adding 1 score and 33 yards on the ground. His previous game experience helped calm any nerves he may have had despite having to endure a screaming sellout crowd. Though Hendrix displayed confidence in his post-game interview, it wasn’t until midway through the 3rd quarter that he looked the part. 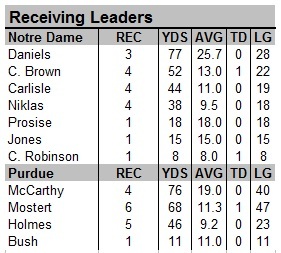 He marched the Irish down on an 80-yard drive, capping it off with a 10-yard touchdown pass to Davaris Daniels. “We have really liked his progression this fall. We always knew he had the athleticism and size to be great, but we were just waiting for his football IQ to develop. He’s right there. And I can’t say I’m too surprised by that,” Kelly said. Daniels’ final touchdown would end up being the nail in the coffin, despite a late receiving touchdown by Jeremy Gallon from Devin Gardner. As noted in our pre-season predictions, Gardner was more than athletic enough as he rushed for 88 yards and a touchdown. However, his inexperience coupled with several dropped passes by his receivers led to a below-average performance. 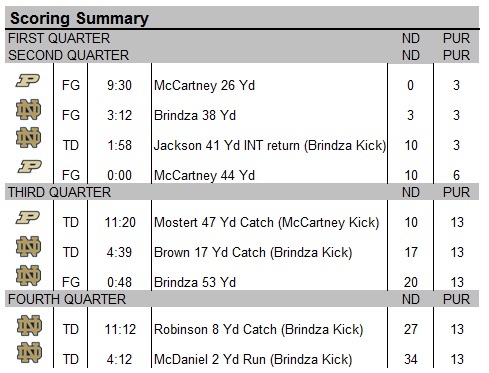 The Irish secondary held him to only 91 passing yards and converted two interceptions. Despite giving up 35 points and 285 rushing yards, the Irish defense was led by Prince Shembo’s 14 tackles, 5 tackles for loss, and 1.5 sacks. The Irish travel to West Lafayette next week to play Purdue for their second night game in as many weeks. SOUTH BEND, Ind. – Many questions surrounding last year’s championship runner-up were answered after Notre Dame easily handled the Temple Owls in both teams’ season openers. The Fighting Irish, led by incumbent starter Tommy Rees, erased any doubts from the Irish faithful by starting the regular season with a 45-10 victory. As expected, the defense and running game put on quite a show for the sell-out crowd. 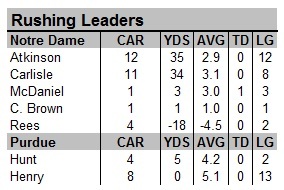 The Irish dominated the ground game with their multi-talented running attack. Amir Carlisle’s first game in Irish uniform was well-received despite many fans’ concerns with his injury risk. Those concerns were quickly alleviated by the end of the 1st quarter when he had already wracked up two of his three total touchdowns. His 100 rushing yards on 19 carries left many Owl fans crestfallen. 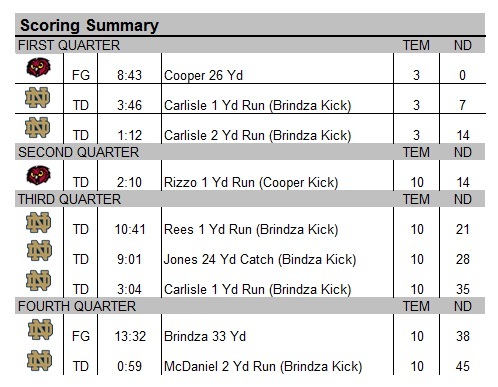 Carlisle started the Irish blowout by capping a five-minute drive with a 1-yard run. After a quick three-and-out by the Irish’s strong defense, Tommy Rees quickly marched them down the field to end the 1st quarter with a 2-yard scamper up the middle by Carlisle. Quarterback Tommy Rees, making his 19th career start, started the 3rd quarter off with a 1-yard quarterback sneak to push the score to 21-10. Surrounded by controversy for the majority of his collegiate career, Rees (now 15-4 as a starter) proved just how capable he is in Everett Golson’s absence. “I felt comfortable. It felt great to get back on the field and start the season with a win,” said Rees, who replaced the suspended Golson. Just one year after the home crowd booed him, Rees was determined to prove how much he’s grown since his tumultuous sophomore season. “It was encouraging to see the home crowd so into the game. It certainly feels great to hear them chanting and cheering,” Rees said with a chuckle. Kelly said he was pleased with his quarterback’s performance. Temple appeared to be on their way to closing the gap in the 3rd quarter, but a long interception return by Austin Collinsworth and a costly fumble recovery by Kona Schwenke quieted the few Temple faithful in the stands. Amir Carlisle replied, once again, with a 1-yard rushing touchdown to put the game out of reach. 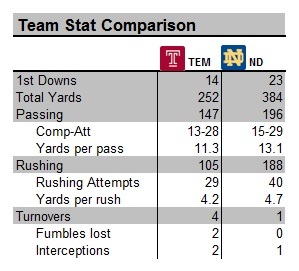 Notre Dame’s stout defense allowed only 252 total yards to the Temple offense. Pair that with the Owls’ four turnovers, and the game quickly got out of hand. “Our goal was to strike quick and strike often,” star lineman Stephon Tuitt said. Tuitt, who was just shy of breaking Justin Tuck’s single season sack record in 2012, recorded his first of many this season. 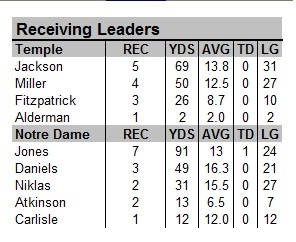 Greg Bryant finished the game with 18 rushing yards, and Jaylon Smith recorded his first collegiate interception. “Both guys came up big for us in different ways. As the season progresses, we’re expecting even better things to come.”* *All stats, quotes, and ideas are purely fictional. This is a simulated recap, is for entertainment purposes only, and does not reflect any actual outcome. There’s not much that compares to being a Notre Dame fan; the fan base is extremely passionate and enthusiastic. But more passionate than them, unfortunately, are the people who hate Notre Dame. So, I thought I would take a few minutes to point out some lies believed and spread by them. I can’t even begin to tell you the number of people that still believe this. It’s on a daily basis that someone makes some sort of comment about this to me. So let’s break it down for them. Those out there claim that Te’o did it for the publicity. Interestingly, Te’o was going to a school that has their own TV contract, where he was the star player, and all eyes had been on him since the start of his Notre Dame career. I was at the first game of his collegiate career when the crowd erupted after he tackled Colin Kaepernick for his first tackle. Manti was loved by the Irish fanbase since signing day and known by the public long before his fake girlfriend came into play. Others try to claim that Manti created the fake girlfriend to boost his Heisman chances. Let’s think about the stupidity of this for a second. In order for a middle linebacker, a true defensive player, to win the Heisman, he would have to have a lot of game changing plays, put up big numbers in tackles, INTs, sacks, TDs or a mixture of those, and his team would have to be in contention for the National Title. So, you are telling me that when Manti was a sophomore, after his coach was just fired, he believed that Notre Dame would be in contention for the national title two years later during his senior season? Seems pretty far-fetched to say the least. Also, you are telling me that Manti would kill off his girlfriend on the same day that his grandmother passed away? I can’t imagine too many human beings out there that would do such a thing, more less someone with the character that Manti has. Also, Stanford players said that Te’o would ask them after their games if they knew his girlfriend. Again, no human being would go to those lengths to try to create a fake girlfriend for any reason. It’s not far-fetched to see how Manti was catfished, as he is a man with very strong religious values. He was a Mormon going to a Catholic school, so there probably weren’t too many people there that shared his faith. Manti’s faith is what his “relationship” with Lennay Kekua was built on. His father would give them a verse each night to discuss with each other and they would have long conversations about them. It’s amazing how faith/religion can impact people, and unfortunately for Manti that is what everything was built on. For those saying Te’o is stil a liar because he didn’t come clean about it before Deadspin broke the story, ask yourself what you would have done. No one can honestly say they would go to the Heisman ceremony and tell the world that they were tricked and that their girlfriend wasn’t real. That would have been very embarrassing, not to mention taken away from the grand spectacle that the Heisman ceremony is. Also, had he done that, people would have been saying he just brought that up at the Heisman ceremony for the publicity. Any normal person out there would have just hoped that everything would just be swept under the rug and gone on with their life. Lastly. I thought I would show you some recent comments people are still making about Te’o. I could name countless kids that needed classes, to raise grades, or get better test scores in order to get into Notre Dame that went onto Big 10, SEC, and all other conferences. However, I don’t think it’s right to point out student-athletes’ academic downfalls, so I won’t include names. All I ask is that you follow Notre Dame recruiting closely for a year, get to know some people close to the program, and you will soon understand just how many kids that the football team would love to have but aren’t able to get in. You would also find out about kids and their troubled high school pasts that ND stopped recruiting because of specific incidents. A lot of times people will ask me why the Irish didn’t recruit this player or that player harder, but the recruiting process for the Fighting Irish just isn’t that simple. One of the funniest things to me about following college football is the way the bottom feeder SEC team fans try to act like they are great because other teams in the SEC have won titles. Sorry Ole Miss fan, but that doesn’t mean you guys are any good. Did Notre Dame get destroyed in the National Championship game? Absolutely. 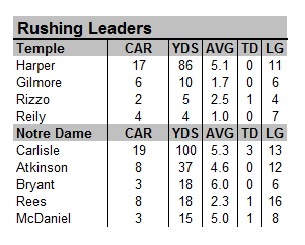 Alabama was the better team, ND had a freshman QB, and Kelly doesn’t have all “his guys” in there yet. But just because Bama destroyed ND, that doesn’t mean a single other team in the SEC was better than the Irish. And don’t play the game of “Georgia gave Bama a better game” or “A&M beat Bama so they are better.” Football is about matchups – and give Nick Saban a month to prepare for Manziel and company and I am pretty sure there would have been a different outcome. 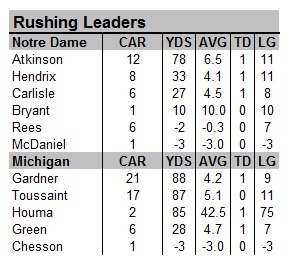 In 2005, I went to my first football game at Notre Dame Stadium. The Irish defeated a Tennessee football team that was ranked on and off throughout the season. As a matter of fact, in the past ten years Tennessee is the only SEC that has played the Irish, with ND winning both games. I don’t know how that’s possible though since the SEC can’t be beat. Looking at many SEC teams’ out-of-conference schedules, you could see why ND hasn’t played teams from this conference more often. Which leads me to my next point. What team wouldn’t want the power to decide who they play for all twelve of their games in a season? Fortunately for Notre Dame, they have that power. They are able to maintain the aforementioned rivalries while also starting new series with teams such as Oklahoma, Texas, Arizona State, and others. To add onto building the schedule of their choosing, they benefit more financially by staying independent. 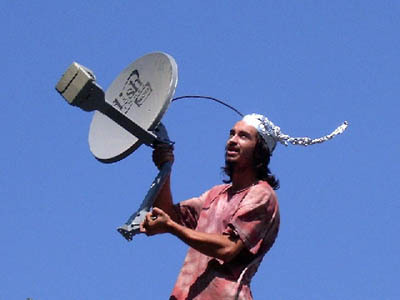 They are able to keep their television deal with NBC instead of having to give games up to Big Ten Network, Fox, or ESPN. So no matter what, Notre Dame is going to play on national TV as long as they stay independent. Also, from a financial aspect, they don’t have to split their bowl money with other teams from a conference. Thus when they got paid for making it to the National Championship, they didn’t have to split it twelve ways. Not being in a conference also helps with recruiting nationally. Notre Dame can schedule games in Texas, California, and anywhere else they would like. This helps in the recruiting process by telling a recruit and his family that they will get a chance to see their son play as he won’t be tied into a number of games in the Midwest. This also helps to show recruits how they are a national brand. Has Notre Dame underachieved some seasons and choked in some bowl games? Absolutely. But that shouldn’t take away from the fact that the Irish have still had a number of strong teams since the great Lou Holtz left. With Bob Davie coaching, ND had two 9-3 seasons (1998 and 2000). In 2002, Tyrone Willingham’s Irish were 10-3. Not to forget the back-to-back BCS trips by Charlie Weis’ team in 2005 and 2006. Weis was a Bush Push away in 2005 from competing for the National Championship. Unfortunately, none of the three coaches after Holtz left were true proven head coaches. If they were even decent head coaches, they would be coaching another big team and leading them to big seasons. That’s not the case, though. Bob Davie is the current head coach at New Mexico where they went 4-9 last year; Tyrone Willingham is currently a volunteer assistant coach for the Stanford women’s golf team; and Charlie Weis coached a Kansas team that went 1-11 last year. Despite those below average head coaches, Notre Dame still reeled off decent enough seasons to put them in BCS bowl games. One could only imagine what a coach like Brian Kelly could have done with those talented teams. Unfortunately, people like to put a target and take aim at Notre Dame for every thing possible. Whether it be a player making a minor mistake or playing a longstanding rivalry with a military school, Notre Dame will constantly get criticized. Irish fans just need to learn to laugh about it and take it all in stride like most at the school do. Just remember, when you are on top, everyone is going to try to bring you down. No matter what anyone says, the eleven National Titles and seven Heisman trophies speak for themselves and prove that Notre Dame is still, and will forever be, at the top! Go Irish! Have you ever wanted a second chance to achieve something you weren’t able to before? Last week, one of my coworkers asked me what sat atop of my bucket list. It only took me a second to answer the question. Others said they would like to pitch in the MLB, spend a day with Jennifer Aniston, etc. For me, though, there’s no question in my mind what I’d do: I would love to throw some routes to Irish wide receivers on the historic Notre Dame football field.My reasoning for wanting this isn’t that simple, though. When I was 9 months old, I had open heart surgery – transposition of the great vessels, to be exact. Growing up as a little kid, I never thought twice about the surgery or about any possible restraints it would have on my life. When I was little, I played baseball, basketball, and soccer, but my passion was always football. Practically every day, I would get some of the neighborhood kids together to play two-hand touch in the backyard or would play my older brother in some one-on-one football. Unfortunately because of my heart surgery, my parents were never too fond of the idea of me actually playing organized football. They worried about me getting hit too hard or not being able to handle the physical exhaustion of the sport. Add this with my doctor telling me I would never be able to lift weights due to the strain it would put on my heart, and my aspirations of being a football player were thrown out the window. It’s frustrating to me because I always wondered what could have been. I always had as good of an arm – if not better – than our quarterbacks growing up. In high school, an assistant coach watched me play flag football in PE class and asked why I didn’t play football. Now at age 27, I am left throwing routes to kids at the end of the work day. Which leaves me wondering what it would be like to throw to some college receivers. Growing up, I was always a Notre Dame fan. I remember watching the great Irish victory over #1 Florida State followed by the tragic loss to Boston College. Sitting in our basement as a kid, I remember holding my brothers hand much like the Notre Dame football players were in hopes that BC would miss their game-winning field goal. However, my fandom of the Irish back then didn’t even compare to my love for ND after I went to my first game in 2005. I watched the Irish defeat Tennessee, despite people saying they couldn’t compete with anyone in the SEC. The game was great despite periods of rain, but the feeling on campus took the visit to a whole different level. There was just something about the campus that felt…right. Lou Holtz said it best: “If you’ve been there, no explanation is needed. If you haven’t, no explanation will suffice. After that moment, I knew that I wanted Notre Dame to be a part of my life. My dream is to work for the University someday, but I understand how slim the chances of that are. Instead, I would love – just to spend five minutes if need be – to throw some routes on the field. Between my passion for Notre Dame and the question of what I could have done on the football field, there is no other dream I’d put atop my bucket list. Maybe I wouldn’t have ever been anything more than a bench warmer, or maybe with some coaching I could have played at the next level. Unfortunately, I will never know. 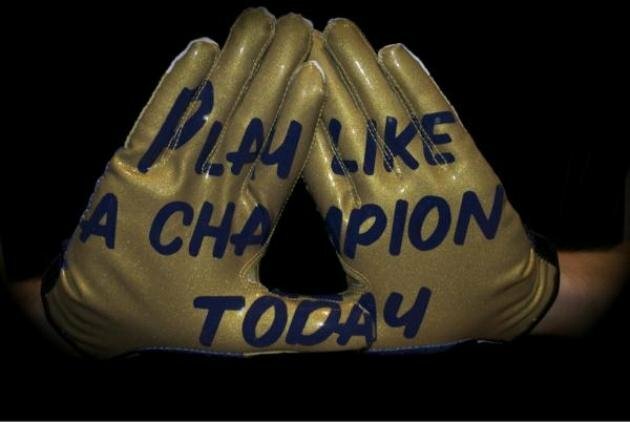 But maybe some day – with some luck of the Irish – I could get a feel of what it’s like to Play Like a Champion Today and throw to some elite college receivers. Until then, Go Irish! Michigan State quarterback, Andrew Maxwell, gets sacked by Irish frontman, Stephon Tuitt. With the recent suspension of star quarterback, Everett Golson, and the naming of Tommy Rees as the season opener starter, the Irish fanbase went baselessly ballistic, causing an immediate uproar of a “9-win-at-best” season. But that got me to thinking… is it possible to have a season similar to last year with Tommy Rees leading the way? It also got me thinking about how blessed we are to have a backup quarterback with 18 career starts and several minutes of mop-up duty under his belt. In fact, many teams we face this year don’t quite have that same luxury. As we all know, the traditional quarterback position doesn’t really exist at Air Force. The starter from last year has moved on, which means junior Kale Pearson will likely take over. What’s worse though, is that Air Force returns virtually no one on offense. In another reloading year, Pearson will have to battle incoming freshman, 2-star quarterback Ben Okun. As if that doesn’t speak volumes enough, Pearson has only 29 passing attempts with a completion rating of 41%. He also didn’t run the ball once last year. I think it’s safe to say that, unless circumstances severely improve, Air Force’s quarterbacks will not be much of a threat against Notre Dame’s powerful defense. A lot of questions surround one of the worst offenses in the country from last season. The starting and backup quarterbacks, Chris Coyer and Kevin Newsome, were switched to H-back and tailback respectively as soon as new offensive coordinator Matt Rhule arrived to implement his pro-style offense. It is assumed that redshirt junior, Connor Reilly, will take over this year if not pushed too hard by incoming freshman P.J. Walker. Whoever starts, though, will be asked to improve upon the 1300 total passing yards and 10 total passing touchdowns from a year ago. Not a tall task by any stretch of the imagination, but I’m not expecting a total makeover overnight either. Purdue has to replace the multi-year starting quarterback duo of Robert Marve and Caleb TerBush. And according to those close with the program, this may take awhile. There’s currently a four-way race, but it looks as if senior Rob Henry is a step in front. He only attempted 38 passes last season and didn’t make the best of those situations amassing a mere 55% completion rating. Also in the mix is freshman Danny Etling who enrolled early. He had a mediocre spring game showing passing for over 100 yards, but has impressed coaches throughout the rest of the spring. Head coach, Bronco Mendenhall, named Taysom Hill as this year’s starter because of his game experience and strong showing in the spring. He carries a lot of athleticism to go along with his agility and escapability. However, jumping from third on the depth chart a year ago to taking the starting role a season later is never an easy task. 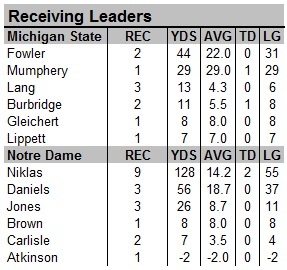 His speed is certainly an upside, but against Notre Dame’s top-tier run defense, that will hardly be a benefit. He only had 4 passing touchdowns to go along with his 71 pass attempts from a year ago. He’ll have to improve on his 59% completion rate and rely less on his legs if he wants a victory come November 23rd. Pittsburgh is faced with a situation that many other Irish opponents are experiencing: replacing a multi-year starting quarterback. Because Tino Sunseri exhausted his eligibility, there’s a tight race between Trey Anderson, Rutgers transfer Tom Savage, and redshirt phenom Chad Voytik. However, none have truly impressed and the verdict is still out. Once again, the Irish will be facing a below-par offense, who finished dead last in the Big East. If Pittsburgh can improve on allowing 3+ sacks a game this season, they will be a step ahead of last year. Until then, the quarterback controversy still remains a mess. Michigan State’s offense last year centered around early Heisman hopeful, Leveon Bell. He averaged 30 carries a game – alone. That certainly took a load off first year starter, Andrew Maxwell. The only issue is, Leveon Bell is up in the NFL this season. Maxwell only completed 52.5% of his passes last season, which is ironic considering most of his passes were no longer than 5 yards. His 13-9 TD/Int ratio isn’t eye-popping either. He will be listed as the starter going into the fall camp, but MSU coaches have already expressed interest in sophomore Connor Cook if Maxwell can’t improve his game. Either way, the Irish defense should have no problem keeping them in check for a third straight year. Everyone’s 2012 preseason Heisman winner was Matt Barkley. Of course, as we all know, that didn’t turn out as expected. With an injury late in the season, the Fighting Irish got a taste of the years to come at USC. Max Wittek came in, threw for 186 yards, and completed 2 interceptions to the Irish defense. He finished the year completing more passes to opposing defenses than passes to his own teammates in the endzone, as well as only 52% of his passes. He’ll be in a tight race this summer and fall with 5-star freshman, Max Browne – who many are saying is the future face of the organization. Like the rest of the Irish opponents this year, though, USC faces some serious lack of experience issues at a position in which it is so vital. Navy runs, runs, and runs. We all know that. Whoever the quarterback is must have endurance and the capability to burn. Keenan Reynolds is expected to start this season after taking over midway through last season for Trey Miller. Since Miller has been released from the academy for what’s believed to be academic violations, the spot is Reynolds’ to lose. He averaged 4 yards per carry and complimented that with 10 rushing touchdowns. 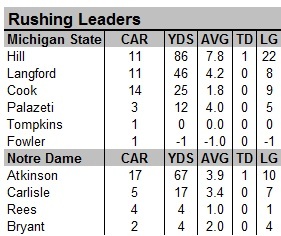 If Notre Dame’s superior run defense can eliminate this threat, he’ll be forced to throw. While Reynolds is one of the better passers out of the Naval Academy, his 9 touchdowns, 900 passing yards, and 56% completion rate are really of no concern. It’s hard to replace a starter who has over 16,600 career passing yards and over 120 career touchdowns, but that is the task head coach, Bob Stoops, is faced with this offseason. The presumptive winner is junior Blake Bell who was used primarily in short-yardage or goal-line scenarios last season. His 11 rushing touchdowns were superb for a backup. But the real question is, can he be an every-down quarterback while passing the ball, too? His 213 yards and 2 touchdowns in the spring game nullify bits of that dilemma, but we all know how spring games go. The question still remains unanswered with Bell, as he hasn’t obtained much game-time experience. It’s been a couple years since Andrew Luck took snaps, and with Josh Nunez as the season opener starter last season, the forecast looked pretty dismal. Now that Nunez has officially “retired” from football, sophomore Kevin Hogan has the spot all to himself. In the six starts he had last year, he was more than efficient. His 72% completion clip is eye-popping at first, until you realize that the majority of those passes were to star tight ends Zach Ertz and Levine Toilolo, and star running back, Stepfan Taylor – all of whom are not returning. More responsibility will fall on Hogan’s shoulders as he soaks in more leadership of the offense after leading the Cardinals to another Rose Bowl victory. Michigan senior quarterback, Devin Gardner, certainly has the size and ceiling to be great. 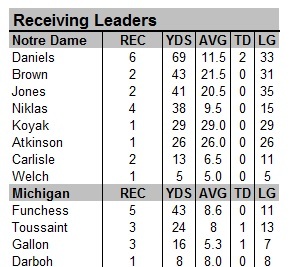 However, for the past couple years, he’s been hiding in the shadows of past star “quarterback,” Denard Robinson. With Robinson headed off to play wide receiver in the NFL, this may be a blessing in disguise for the Wolverines. Gardner started 4 games last season, completed 60% of his passes, and had a 6-touchdown performance against Iowa. The potential is already there. The skillset is already there. But will only a few games of experience be enough to make a difference by Week 2 of this season? As the season rolls on, I expect Gardner to have a spectacular year. But, I think the top defense in the country will be too much for him to handle on September 7th. Notre Dame’s defense faces its toughest quarterback challenge all season on October 5th against Arizona State. With a full season of starting experience under his belt, junior Taylor Kelly is primed to improve on what was already an extremely impressive first year. This dual-threat quarterback threw for over 3,000 yards, ran for 500, and had 30 total touchdowns. He’s efficient, too, as he completed 67% of his passes and only threw 9 interceptions. There is hope for Irish fans, though. Notre Dame is the last game of a nasty four-game stretch for the Sun Devils that also includes Wisconsin, Stanford, and USC. Regardless, they’ll come out ready to play their best game against the Irish with Taylor Kelly leading the charge. Year in and year out, Notre Dame plays a tough schedule. But this year, their schedule is littered with name-brand teams with little or no experience at the most critical position. 10 of the 12 teams don’t have an established quarterback with even a year of starting experience. If South Bend produced the best defense in the country in 2012 against a schedule crowded with top-tier quarterbacks, what’s the limit for the 2013 Irish defense against a schedule with several inexperienced signal-callers?